BREMEN, Germany — Two NASA science missions, one studying the largest objects in the asteroid belt and the other searching for planets around other stars, are expected to come to an end in the coming weeks when each exhausts their remaining hydrazine fuel. In a talk Oct. 4 during the 69th International Astronautical Congress here, Marc Rayman, chief engineer and mission director for the Dawn mission at the Jet Propulsion Laboratory, said current estimates had the spacecraft exhausting its remaining hydrazine, and thus ending the mission, in the middle of this month. 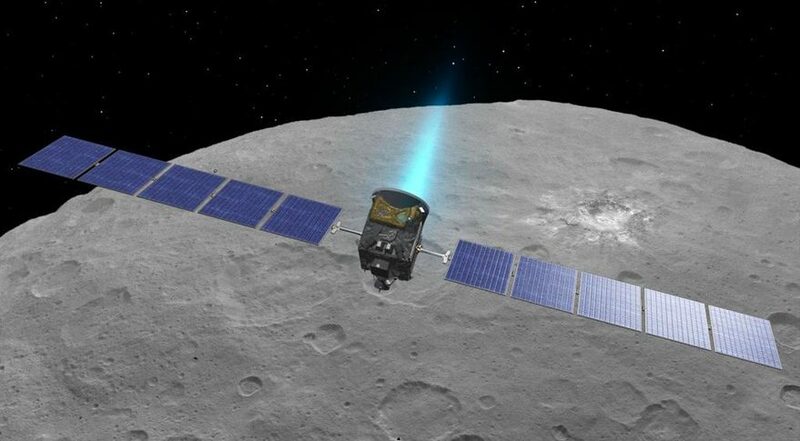 Dawn, launched in September 2007 on a mission to orbit the large asteroid Vesta and dwarf planet Ceres in the main asteroid belt, has relied on thrusters using hydrazine to orient itself since the failure of its reaction control wheels several years ago. “When the hydrazine is depleted, because that’s the sole basis for attitude control, the spacecraft will lose attitude control and the mission will end,” Rayman said. A similar fate awaits Kepler, launched in 2009 to search for exoplanets by looking for brief, periodic dips in brightness of stars as planets cross in front, or transit, them. The failure of two of Kepler’s four reaction wheels in 2013 forced engineers to devise an alternate control mechanism using the spacecraft’s thrusters. The spacecraft, though, is running out of hydrazine, a development long expected by mission managers. The spacecraft went into a safe mode in July when telemetry suggested the spacecraft might be running out of fuel. Kepler transmitted the data from that observing effort, known as Campaign 18, in August, then went into safe mode again until Aug. 29, when it started a new observing session, Campaign 19, despite issues with a malfunctioning thruster. In a Sept. 28 statement, NASA said it had again put Kepler into safe mode because of problems pointing the spacecraft precisely. The spacecraft will transmit the data it collected in Campaign 19 back to Earth Oct. 10, assuming it has enough hydrazine on board to carry out that work. When Kepler does run out of fuel, it will drift in its orbit around the sun harmlessly. The situation is different for Dawn, which is in orbit around Ceres, a dwarf planet that has water ice. Rayman said planetary protection protocols require that Dawn be able to maintain its orbit, which currently brings it to within about 35 kilometers of the surface of Ceres, for at least 20 years. That should not be a problem, he said. Simulations of the spacecraft’s orbit show a 99 percent chance it will still be in orbit after 50 years, the longest the simulations have been run. “The lifetime in orbit is likely significantly longer than that,” he said. That 20-year requirement is not based on any expectation that the spacecraft will be sterilized from radiation exposure during that time. Instead, that 20 years is intended to provide enough time to mount another mission to the world before its surface is contaminated by the impact of the spacecraft.